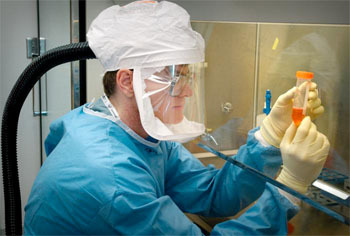 Centers for Disease Control and Prevention's Dr. Terrence Tumpey, one of the organization's staff microbiologists and a member of the National Center for Infectious Diseases (NCID), showed him examining reconstructed 1918 Pandemic Influenza Virus inside a specimen vial containing an orange-colored supernatant culture medium. Image by James Gathany, courtesy of CDC. Current research is revealing many clues in our fight against global infectious diseases. Through understanding the fundamental biology of symbiosis and host-microbe relationships, we are one step closer to preventing the spread of illnesses such as malaria, river blindness and dengue fever. In this WebQuest, you will research the biology of the obligate, intracellular bacterium Wolbachia. You will explore its impact on the reproduction, evolution and pathogenicity of its host, and evaluate its use in pest control and disease management. Collaborating with classmates, you will serve on a specialized task force to address the implications this research could have on preventing the next great epidemic. This material is in part based upon work supported by the National Science Foundation under Grant No. IOS-0852344. Any opinions, findings and conclusions or recommendations expressed in this material are those of the author(s) and do not necessarily reflect the views of the National Science Foundation (NSF).